Personalised medicine, new discoveries and studies on rare exposures or outcomes require large samples that are increasingly difficult for any single investigator to obtain. Collaborative work is limited by heterogeneities, both what is being collected and how it is defined. To develop a core set for data collection in rheumatoid arthritis (RA) research which (1) allows harmonisation of data collection in future observational studies, (2) acts as a common data model against which existing databases can be mapped and (3) serves as a template for standardised data collection in routine clinical practice to support generation of research-quality data. A multistep, international multistakeholder consensus process was carried out involving voting via online surveys and two face-to-face meetings. A core set of 21 items (‘what to collect’) and their instruments (‘how to collect’) was agreed: age, gender, disease duration, diagnosis of RA, body mass index, smoking, swollen/tender joints, patient/evaluator global, pain, quality of life, function, composite scores, acute phase reactants, serology, structural damage, treatment and comorbidities. The core set should facilitate collaborative research, allow for comparisons across studies and harmonise future data from clinical practice via electronic medical record systems. Research questions of the current era require ever larger study populations which often exceed the number of patients available in individual studies or registries; hence, combined or pooled analyses are often required. Such collaborative work is, however, compromised by heterogeneities in the data collected.1 More recently, routinely collected data from electronic medical records (EMR) has the potential to support research, but there is no agreed set of data that would be desirable to collect in order to generate research-quality data if used beyond direct clinical care. To facilitate collaborative research, standardising items (‘what to collect’) and their instruments (‘how to collect’) across studies and data collections is critical. Although guidelines on data reporting and outcome measures have been developed, such core sets have so far pertained to randomised control trials and trial extension studies in rheumatoid arthritis (RA)2 3 and have not been vetted against the feasibility of data collection in routine clinical care or against the needs of observational research. Indeed, any core data set to be implemented in registers, research cohorts or EMR systems need to strike a balance between clinical feasibility and the potential to generate useful, research-quality data. For these reasons, a European League Against Rheumatism (EULAR) task force was convened to develop a standardised core set for data collection in RA that should (1) harmonise data collection in future observational studies, (2) act as a common data model against which existing databases and EMR systems can be mapped and (3) ensure that new data collections in routine clinical practice can support the generation of future research-quality data. The task force comprised a steering committee (n=10, including two co-conveners (WD and JA), a EULAR methodologist (LG), a patient partner (CZ) and three fellows (HR, KC and EN)), a working group (additional 15 experts from 11 European countries and the USA, including patients, clinical researchers and experts in the area of epidemiology, quality of care and common data modelling, physicians and other health professionals) and a pan-European expert panel (n=90). An hierarchical literature review was carried out by the fellows in PubMed to identify data items and instruments used in existing RA registers and clinical cohorts and the frequency with which these items and instruments were collected. Results were cross-checked with EULAR recommendations for reporting in RA clinical trials and trial extension studies2 3 and with the EULAR outcome measures library. Items and instruments felt to be missing could be added by the steering committee. In an online survey, the expert panel rated the perceived importance of each of the above items (and instruments) to be included in a core set, using a grading scale from 1 (not important) to 9 (very important). Again, items and instruments could be added. At the first face-to-face meeting of the working group, electronic voting on individual items and instruments to include in the core set took place. We defined consensus as ≥ 70% of participants voting either YES or NO to the inclusion of a given item; if no consensus was reached, a second vote took place after a brief discussion which was led by an independent moderator (DP). In this second round, the threshold for consensus was lowered to 60 % . The resultant list of items that had reached consensus for inclusion informed a single round of voting on the instruments with which to collect information on the items. Additional information on items and instruments for which no consensus was reached was collected. Ratification of items included, reasons for any exclusion and voting on items that had not reached consensus at the face-to-face meeting was performed via an online survey within the working group. At the second face-to-face meeting of the working group, voting was conducted for outstanding items, then for final approval of the complete core list of items, followed by voting on instruments for all items in the final list using the same method of moderated discussion and voting cut-offs as outlined above. Flow chart of the multistep process of the project. DMARD, disease-modifying antirheumatic drugs; HRQol, health-related quality of life; MSK, musculoskeletal; NSAID, non-steroidal anti-inflammatory drug; RA, rheumatoid arthritis. In all voting processes, the panellists were reminded of the importance of striking a balance between clinical feasibility and the potential to generate research-quality data. Published articles from 67 different European RA registers and clinical cohorts were included. In total, 39 items and 125 instruments were identified; eight additional items for consideration were added (see tables 1 and 2 in the online supplementary file 1). Ninety experts from 28 different European countries including patients (18%), allied health professionals (18%), physicians (55%) and researchers (10%) participated in the survey. Twenty-nine of the 47 proposed items were considered important enough for inclusion into a core set (see table 2 in the online supplementary file 1). Twenty-one out of 25 (84%) members attended. In the first voting round, consensus for inclusion was reached for 16/47 (34%) items and consensus for exclusion for 16/47 (34%) items. After discussion and a second round of voting on the remaining 15 items, consensus was reached for inclusion of 5 and for exclusion of 7, leaving two items (‘health-related quality of life’ and ‘socioeconomic status’) without consensus (see table 2 in the online supplementary file 1). Twenty-three out of 25 (92%) members participated. The voting results from the face-to-face meeting were confirmed except for socioeconomic status, health-related quality of life, fatigue and joint surgery (lack of consensus). Seventeen out of 25 (68%) members attended. Voting led to the exclusion of items ‘fatigue’, ‘joint surgery’ and ‘socioeconomic status’ but inclusion of ‘health-related quality of life’. Next, the resultant set of the remaining 21 items was voted on in its entirety and 100% of the participants agreed (see table 1 in the online supplementary file 1). Moderated discussion and sequential voting on the instruments with which to collect these 21 items resulted in consensus for all but two instruments (how to collect data for items ‘glucocorticoids’ and ‘comorbidity’). A final ad hoc online survey with prespecified suggestions provided by the steering committee for the outstanding instruments for items ‘glucocorticoids’ and ‘comorbidity’ was performed (see table 3 in the online supplementary file 1). Twenty-one out of 25 (84%) members participated and consensus was reached. The final core set thus contained 21 items, each with its preferred instrument (see table 1). 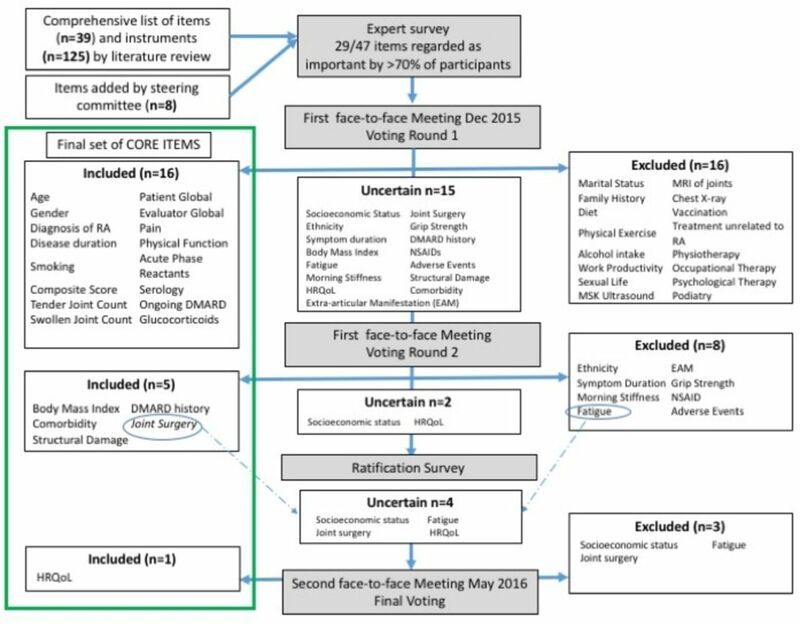 This EULAR task force has defined an RA core set, including both items and instruments to support standardised RA data collection in clinical practice and research. This will enable collaborative research studies and increase comparability across studies. Unlike most previous core sets, this set was specifically developed keeping clinical feasibility in mind. Importantly, ‘core’ underscores that the set represents a minimum, acknowledging that individual stakeholders are likely to add items or instruments of particular interest to their own data collection. Consensus for inclusion was straightforward for the majority of items: 16 of the final 21 items were agreed in the first round of voting. Six additional items were included, and after a ratification survey and discussion, ‘joint surgery’ was excluded in the subsequent process. Discussion for each item is summarised in table 3 in the online supplementary file 1. Of the 26 items ultimately excluded from the core data set, nine were seen as important by the expert group. One item, ‘fatigue’, was excluded from our core data set, yet is present in the Outcome Measures in Rheumatology (OMERACT) core outcome set for RA trials.6 Discussion during the meeting acknowledged that this item was important but depending on many factors unrelated to RA and can be captured by the patient global assessment of disease activity (PGA). The group repeatedly revisited the scope of a core set and agreed that fatigue was a good example of an item that might regularly be collected in addition to the core set for either clinical practice or research. The task force was established to include expertise in registers and observational research, clinical practice, use of EMRs, the patient perspective, as well as methodological expertise in the development of core data sets7 to enable robustness and transparency. To ensure inclusiveness, all national European rheumatology societies were invited to contribute. Dissemination of the core set will be facilitated by publication online (EULAR website) and via national societies. Following agreement on this core set, it is important that it is adopted by future observational data collections and research studies in RA. For EMR systems to deliver to RA research, the core set also needs to be integrated into EMR systems. Additional clinical benefits of collection of structured data such as informing consultations, viewing longitudinal disease progression, supporting audit and benchmarking care quality8 should be recognised and may encourage its clinical adoption. In summary, through a multistep, multistakeholder and evidence-based process, this task force has developed an RA core set that may (1) harmonise data collection in future observational studies, (2) act as a common data model against which existing databases can be mapped and (3) serve as a template for standardised data collection in routine clinical practice to support the generation of research-quality data. This effort, which will continue to be updated and revised after evaluation of its implementation, may serve as an example for other conditions beyond RA. The authors want to thank all contributing experts who participated in the online survey. Contributors All authors listed fulfill authorship criteria. They have contributed to the task force being part of the working group. They have been engaged in the conception of the work, attended meetings and were involved in drafting the manuscript. Funding This project was funded by a EULAR project grant.